Wandering around the most beautiful historic district in the United States, it was easy for me to get lost in this city’s seductive atmosphere. One of nearly two dozen green squares appears every few blocks, dotted with benches and monuments and live oak trees dripping with Spanish moss. Genteel structures surround the squares, harkening back to when cotton was king and the city prospered, thanks to General Sherman’s decision not to torch Savannah during the Civil War, as he did to Atlanta. As a result, this area teems with gorgeous buildings, the likes of which will never be built again. These are my favorites. 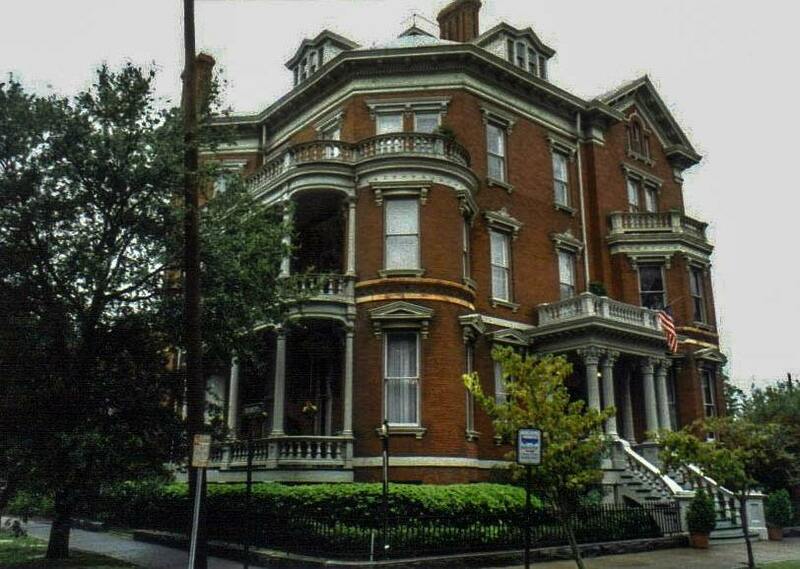 This is the house I would want to live in if I resided in Savannah. Anchoring a corner of Columbia Square, Irish immigrant and iron foundry owner William Kehoe had the mansion built in 1892 at a cost of $25,000 for himself, his wife, and their 10 children. Barely 40 years later, Kehoe’s heirs sold the house, and it passed from the family. After its conversion to a boarding house and then a funeral parlor, legendary New York Jets quarterback Joe Namath took ownership of it before re-selling it. Two years later, the current Kehoe House Bed and Breakfast opened. The undeniable curb appeal of this three-story red-brick building with stately gray details features bay windows and a rounded corner, multiple balconies, and plenty of balustrades and columns. Tall chimneys rise from the dormer roof, and a private brick-paved courtyard with wrought-iron gates and furniture provides a tranquil outdoors space for guests at the B&B. From its beginning in 1842 until 1985, this Greek Revival home fronting Orleans Square was occupied by only two families — Aaron Champion, who left it to his daughter and son-in-law, James W. McAlpin, and, subsequently, to various family members, and Alida Harper Fowlkes, who purchased it in 1939 for $9,000 and lived there until her death in 1985. Her will handed the property over to the Society of the Cincinnati, which conducts tours of the Harper Fowlkes House five days a week. The outside looks like large blocks of stone, but it’s really gray bricks, stuccoed and scored. Porticos rest on square and Corinthian columns, and six chimneys that support the house’s dozen fireplaces rise from the dormer roof. Inside, handsome rooms include a double front parlor, sitting room, and reading room, and gasoliers-turned-chandeliers, original to the home since 1847, are found throughout. My favorite feature, however, was the symmetrical curving stairs that welcome guests up to the entry level. 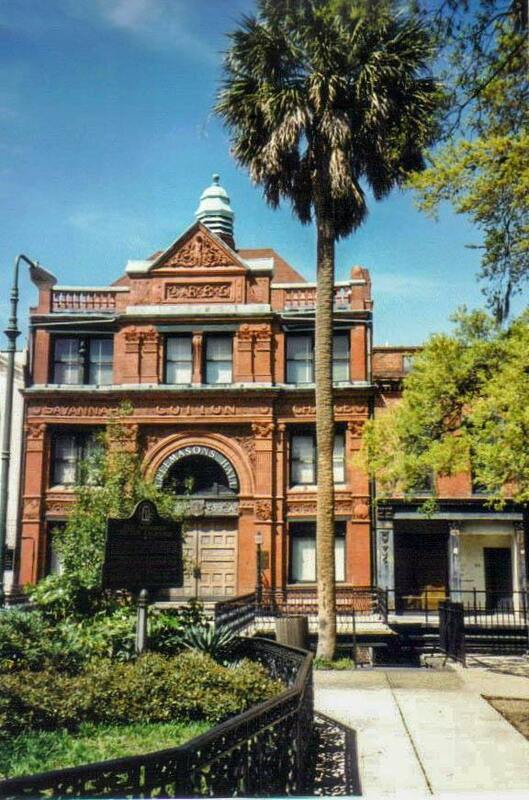 Cotton’s importance to the development of the city cannot be denied, and the Savannah Cotton Exchange serves as one of its greatest reminders. Completed in 1887 in the area referred to as the “Wall Street of the South” when Savannah was the top cotton seaport on the Atlantic and second in the world, the building served as the hub of the city’s economic life. Two million bales of cotton moved through Savannah every year, until the industry came to a crashing end thanks to the ravenous boll weevil, making the building obsolete by 1920. Nearly 80 years later, it’s still a handsome structure. Built of red brick, the three-story exchange sports some fine terra cotta ornamentation, iron lintels, and copper finials. And the iron fence in front of it, with acanthus leaves and medallions of famous authors, poets, and statesmen, surrounds a swath of grass with a fountain and statue of a griffin. 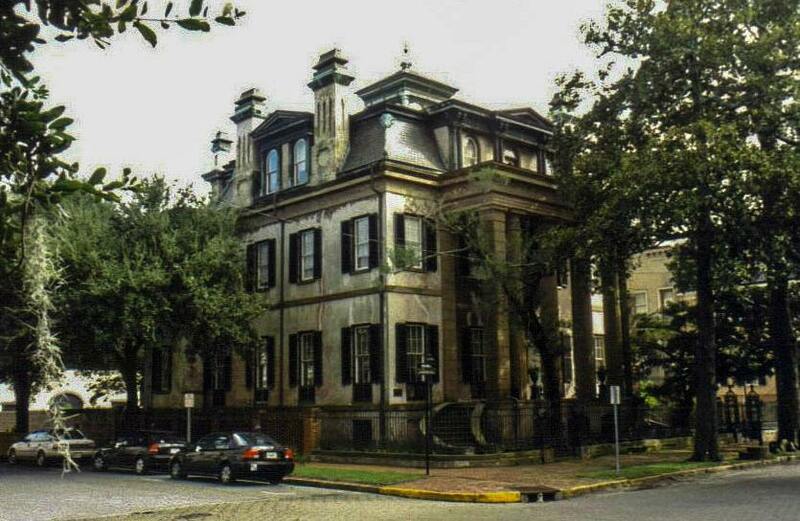 After cotton shrank in importance, the exchange was used by the Savannah Chamber of Commerce until 1974, when it was converted to a Masonic Hall. 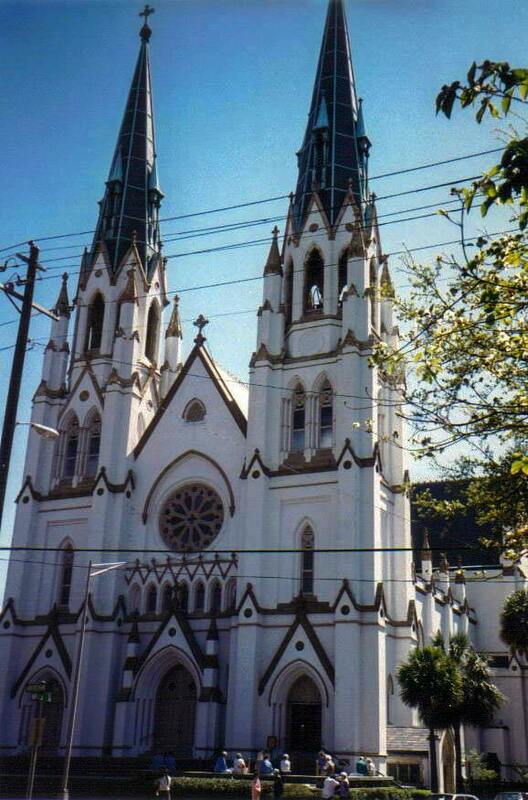 Roman Catholics, who were prohibited from settling in Savannah by England’s colonial charter, now boast the city’s most beautiful church. Completed in 1896 and nearly destroyed by a fire two years later, the Cathedral of St. John the Baptist traces its origins back to French Catholics who fled Haiti after slave rebellions there in 1791. Today, the two soaring spires scrape the city’s skyline and welcome visitors inside. The brick structure received a coating of stucco and whitewash upon its completion, and stained-glass windows were added in 1904. The groin ceiling sports an eye-catching blue, dotted with stars, above the side aisles. Filled with stained-glass windows, statues, murals, and impressive Stations of the Cross, entering this airy, light-filled cathedral remains an uplifting experience. 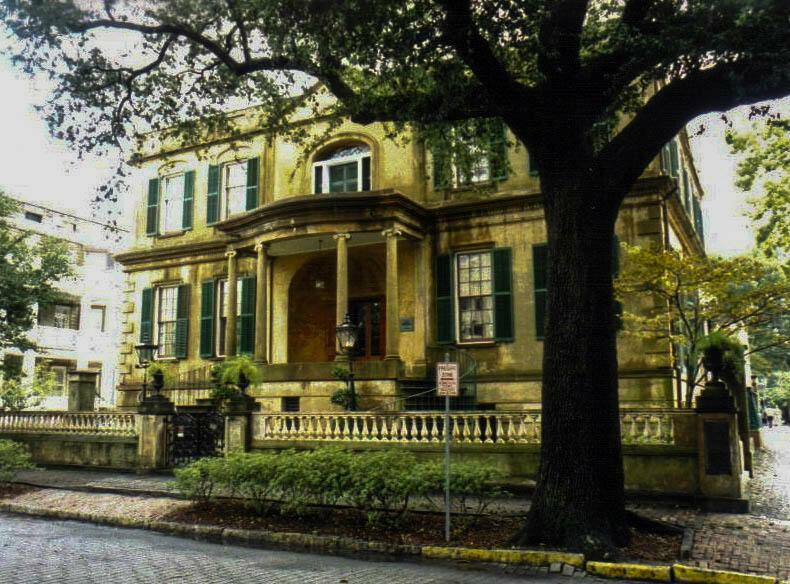 The finest example of English Regency architecture in the United States, the Owens-Thomas House opened to the public as a historic house museum long after it was designed in 1819 to echo comparable buildings in Bath, England. Originally occupied by attorney and politician George Welshman Owens and eventually by his granddaughter Margaret Thomas, the house, which hosted the Marquis de Lafayette as a guest in 1825, was designated a National Historic Landmark in 1976. The cream-colored façade features green shutters around its many windows, and a cast-iron veranda sports elaborate acanthus scroll supports. Inside, the collection of furnishings and decorative arts, mostly from 1790 to 1840, transport you back in time, and the highlight — a bridge over an open stairwell, created by the double staircase that connects the public front rooms to the back of the house — made me truly appreciate the thoughtfulness of the architect.